02:26 So, a doctor MD or DO usually has at least three or four years of undergraduate school getting their Bachelor’s, Science or Bachelor’s Arts usually in scientific fields, doesn’t always have to be though. Then they get accepted into Osteopathic school or Allopathic school, which is a four year program. And then they go into their specialty training from there. So, internal medicine residency right now, for example, is 36 months as his family practice Obstetrics and Gynecology for years and all the way up to 8 to 10 years if you get into a Cardiothoracic surgery or Neurosurgery. 06:40 Osteopaths are also trained in what we call OMT osteopathic manipulative therapy. And what that is, that is a form of manipulating the musculoskeletal system to increase blood flow to certain areas of the body, be at the back, the arms, the legs ahead, the cranium, trying to increase blood flow. There’s a statement in osteopathic medicine made by the founder, 80 still that says the rule of the artery is supreme and what he basically means by that is to get something to heal, to get some to function well, to get some to survive and live optimally. 08:33 Both general internal medicine and hospitalist work. Some have moved to larger cities, mostly in the greater Utah, Salt Lake area. Some have moved to a rural communities in Southeast Idaho. Oh. And the Fellowship also here’s some other residents have some interest to further their education with the fellowship Rheumatology be one of those that seem to peak some interest or critical care. 09:29 So your Nephrologist, your Cardiologist, your Gastroenterologist? Yes, your GI guys, all those go into, they all have the three year internal medicine residency behind them and then they go into their sub specialty from there. 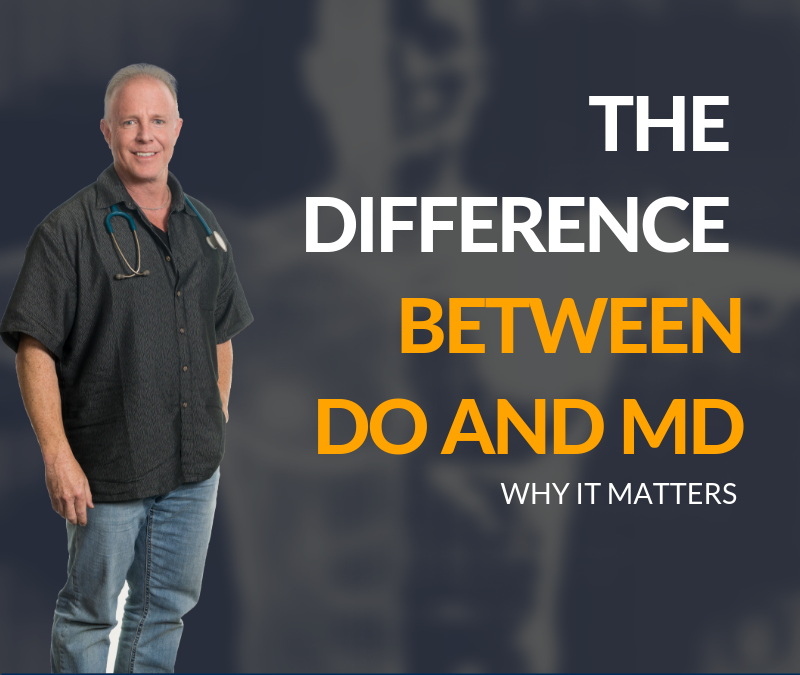 10:33 most of the public would not understand or even recognize the difference between an MD doctor or a DO doctor. And there was a historically those separate residency’s Osteopathic and Allopathic residencies. There was a concerted effort in 2013, 14, I believe, to look at expanding residencies a bringing all residencies maybe under one umbrella. And so they began to be a merger about five years ago and asking all residencies, Allopathic and Osteopathic residencies to come under one banner. And so many of the DO residencies in the United States have began to move that direction under ACGME. And I wish I could pull that up because we use it so freely, what is ACGME, but basically that is, you know, better than 70 percent of our residencies are certified by the ACGME in the United States. 12:54 I think at one time there were about 25 to 30 DO medical schools in the United States. There’s been a slight increase over the last probably 10 years with a few Osteopathic medical schools jumping up. In fact, the Idaho College of Osteopathic Medicine, just opened up in Idaho, our first a medical school in Idaho. It’s an Osteopathic school, so right around that number. For Allopathic, it’s been kind of the traditional arm of medicine. There are the ones that you would think of the dukes and Stanford medical and Mayo Clinic, Harvard, you know, you name it, those have been more of the traditional academic medical schools from the Allopathic or MD side. And I couldn’t even venture a guess to say how many, probably in the hundreds of schools in the US. 20:16 you consider part of your health, we don’t think about the muscoloskeletal system being the biggest component of our bodies and how important that is in health. And how manipulative therapy, how moving, how muscle contraction changes everything. I do, I have a podcast coming up here for those who like to listen to RecoverMe podcast about longevity. And it’s just about what is the most, what is the number one thing you can do to stay alive and have a good quality of life the longest and may be given away with the whole thing’s about. But it’s about movement. It’s about muscle contraction. That is the secret to longevity. 25:14 I don’t see where this could not help with people coming together. And again, for maybe there are components that we will begin to learn from Allopathic residents that begin to join our program. Do they have some other skills, some other ways that they work through differential diagnosis from the Allopathic side? Are there things that we can learn from them and vice versa. We’ve already touched on the manipulation side that Osteopaths practice. But what did the Allopathic have to offer? And we’re a little naive to that may be from our side because we have not been, we’ve not had Allopathic MD residents in our program, so it’ll be an interesting transition and I can only think that it will help with learning and will only help with patient care. If it puts a few more, again, the proverbial tools in the tool box, I can really only help with patients. I think it also lends to some collaboration, MDs that may ask their DO counterparts, hey, I’m stuck with this. What would you think? What other alternatives would there be? and vice versa, maybe an Osteopathic resident would say, call in your training, what did you see with x, y, and z? And so I think it’s more education that this will just be beneficial. I think it’s a win all the way around. All this was great with Shane as my guest. Everyone listening and reading this, thank you. Shae is full of resources. So you medical students thinking of residency out there, check out the Blackfoot, Idaho internal medicine residency program at Bingham Memorial Hospital. Just a spectacular little program which is amazing doctors. The head of it and great administration as you just met a really great program. It’s just going to mushroom here with this combination. A TIP FROM TODAY’S SHOW: Together DOs and MDs enhance the state of care available in America. The difference between the two is, DOs have some extra training in the Musculoskeletal system. And that’s kind of a whole person approach if you will.